Wow Wow Wow! Wish I had thought of this! Beautiful! Really nice design and so well-made. Gorgeous, love how you did the ribbon. this is a lovely card! I really like the ribbon treatment! 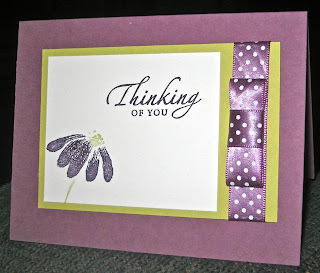 Lovely card - what colours and products did you use? Beautiful card. I would also love to know how you put the ribbon bow together. I like the simplicity of this card! I am trying not to get too distracted by too many details when I make my cards. This one has such style!